I have been examining your annual reports but it seems that the payments to others DHBs were not presented. 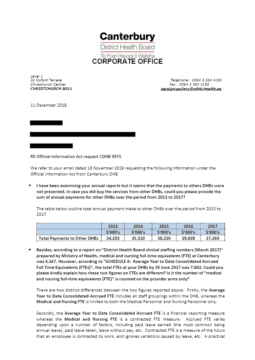 In case you did buy the services from other DHBs, could you please provide the sum of annual payments for other DHBs over the period from 2013 to 2017? Besides, according to a report on “District Health Board clinical staffing numbers (March 2017)” prepared by Ministry of Health, medical and nursing full-time equivalents (FTE) at Canterbury was 4,347. However, according to “SCHEDULE 4: Average Year to Date Consolidated Accrued Full Time Equivalents (FTEs)”, the total FTEs at your DHBs by 30 June 2017 was 7,843. Could you please kindly explain how these two figures on FTEs are different? Is it the number of “medical and nursing full-time equivalents (FTE)” is counted on the provider arms only?